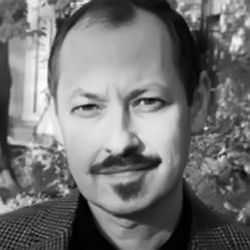 Quick Study: Vadim Yarmolinets, who has lived in the United States for over 20 years, is a fiction writer, journalist, and radio host who also founded a literary award. The Yarmolinets File: Vadim Yarmolinets is a journalist and fiction writer who made the Big Book Award short list in 2009 with the novel Lead Zeppelin: Jericho 86-89, a book that includes Yarmolinets’s native city, Odessa, and a journalist character who’s forced to move to the United States. Yarmolinets’s literary resume also includes books of “ironic prose,” essays, and stories. He has worked as a journalist in Odessa and New York, and hosts a morning show on Davidzon Radio, an AM station. Yarmolinets’s Places: Born in Odessa, where he studied in the foreign language department of Odessa University. Emigrated to the U.S. in 1989. Lives in New York.